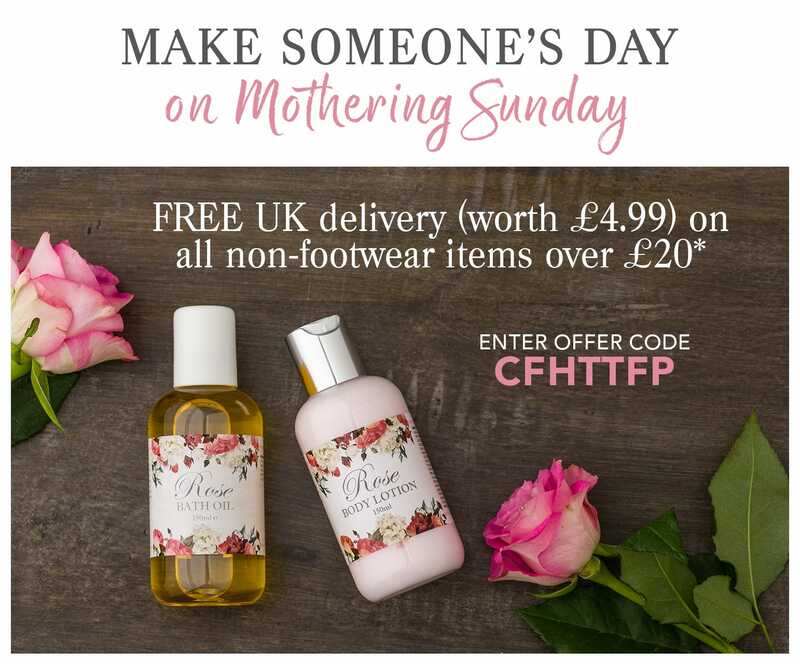 Make a loved one feel extra special on Mothering Sunday (11th March 2018) and enjoy free delivery (UK standard) worth £4.99 on all non-footwear items worth £20 or more! Make a loved one feel extra special on Mothering Sunday (11th March 2018) and enjoy free delivery (UK standard) worth £4.99 on all non-footwear items worth £20 or more! Offer ends 11.59pm on Tuesday 6th March 2018. To redeem our free delivery offer (UK standard), simply add any non-footwear item/s worth £20 or more to your basket and enter the offer code CFHTTFP when prompted. Free delivery (UK standard) will be applied to the order. This offer does not apply to footwear orders. This offer expires at 11.59pm on Tuesday 6th March 2018. Cannot be used in conjunction with any other offer. Offer available on in-stock items only and/or if all items are in stock. We reserve the right to withdraw this offer at any time.